Shields & Company, Inc., a leading middle-market investment bank, is pleased to announce the successful recapitalization of Inline Plastics Corp. (“Inline” or the “Company”), a manufacturer of thermoformed plastic ‘clamshell’ packaging. Inline retained Shields & Company, Inc. to evaluate a range of capital structures that would support the Company’s strategic objectives. This process resulted in a recapitalization with PNC Bank that increased working capital financing to support the Company’s rapid growth and provided excess liquidity to meet certain shareholder objectives. Inline Plastics Corporation produces a range of over 300 proprietary container configurations that are sold nationally to supermarket supply distributors, to food processors, and directly to supermarket chains. Inline’s polyethylene terephthalate (“PET”) containers are typically used in a supermarket in-store bakery, deli, or produce departments to package retail baked goods, deli items, or fresh produce. The Company’s patented Safe-T-Fresh® product line has become the industry standard for tamper evident and tamper resistant thermoformed packaging and has established Inline as the leading innovator in addressing food freshness and consumer safety. Established in 1968, Inline is headquartered in Shelton, Connecticut, with additional facilities Connecticut, Utah, and Georgia. Shields & Company, Inc., founded in 1991, is a preeminent middle-market investment bank dedicated to providing middle-market corporate finance services in the areas of mergers and acquisitions; corporate restructurings and recapitalizations; debt and equity capital raisings; financial advisory assignments; business valuations; and fairness opinions. For more information, please visit our website at www.shieldsco.com, or contact us at (781) 890-7033. 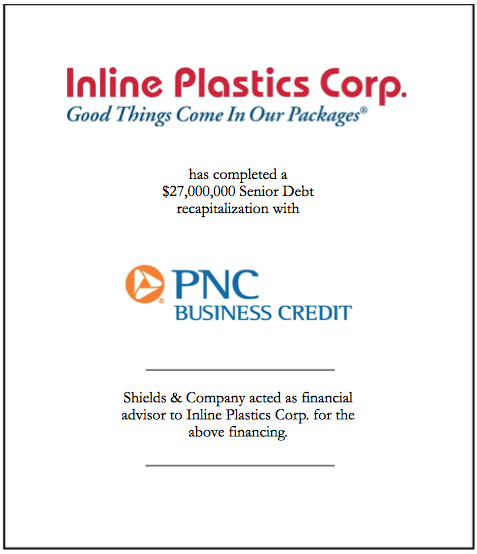 Shields & Company acted as a financial advisor to Inline Plastics Corp. for the above financing.